Toronto District School Board’s Christmas Break starts Friday, December 20. The children will be back in school on Monday, January 5, 2014. 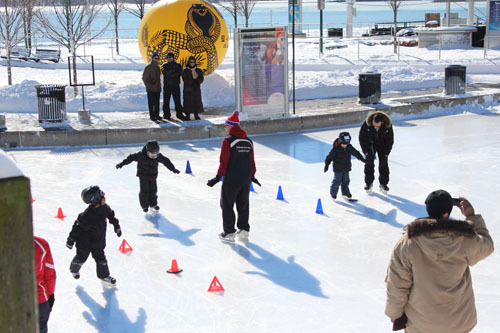 Lucky for the kids, the weather has been cold and Toronto’s many outdoor rinks are open and free. Do note, however, that the rental of skates costs money. At Harbourfront, for example, it is $8. A list of rinks is on: http://bit.ly/18D4qEC. With all this recent snow, you can also have fun with a sled, or even a cardboard box and a treeless hill. Skating at Harbourfront. Copyright ©2013 Ruth Lor Malloy. Toronto has several Historic Museums with relatively inexpensive programs of Christmastime traditions that should be of interest to school children. A Victorian Christmas complete with real candles on a tree is at Colborne Lodge in High Park. 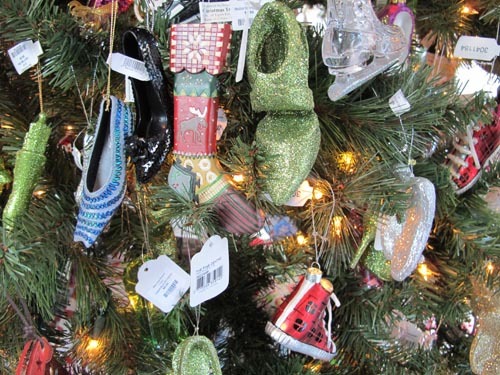 Did you know that Queen Victoria’s German husband Prince Albert popularized Christmas trees in Britain? Scottish programs are at Mackenzie House and Gibson House. A Regency-era Christmas is at Todmorden Mills. They all have hands-on lessons for children in such skills as gingerbread-cookie and Hedgehog Tipsy Cake-making. Not all museums are open daily and each has a different entry fee – no more than $10 for an adult and less for kids. This website also explains about the free Museum+ Arts Pass, available from any Toronto Public Library as long as supplies last. These of course are in much demand so enquire about them at your local library as soon as possible. Miniature Shoes at the Bata Shoe Museum. Copyright ©2013 Ruth Lor Malloy. These passes allow you and family free entry into all these Historic Museums. With them, you can also visit without paying the AGO – Art Gallery of Ontario, Bata Shoe Museum, Black Creek Pioneer Village, Casa Loma, Gardiner Ceramics Museum, Museum of Inuit Art, Ontario Science Centre, ROM – Royal Ontario Museum, Textile Museum of Canada and Toronto Zoo. See: http://www.torontopubliclibrary.ca/museum-arts-passes/index.jsp . If you are a newly-minted Canadian citizen, you should have received a complimentary Cultural Access Pass. It’s good for one year for free entry “to 1000 of Canada’s cultural treasures, 25 of which are in Toronto.” See: http://www.icc-icc.ca/en/cap/ . 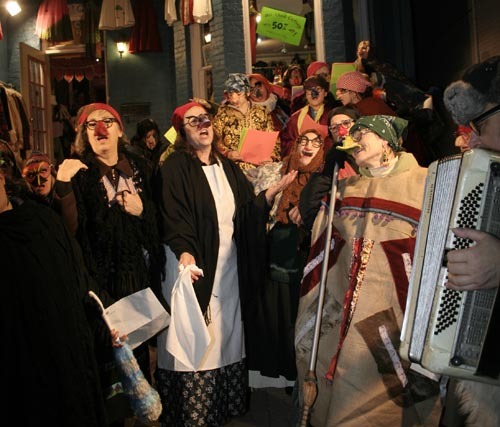 Our www.torontomulticulturalcalendar.com lists several programs of free or inexpensive Christmastime traditions. 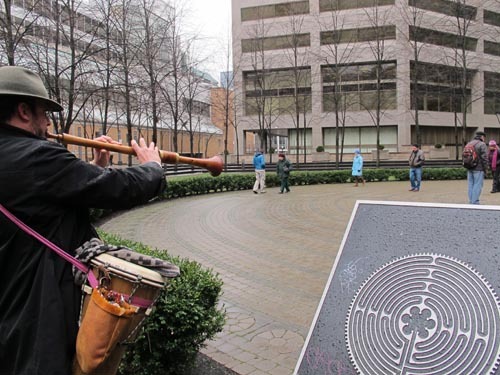 On Saturday, December 21, you’ll find a Labyrinth Walk with live music near Eaton Centre. You can take your kids there if they are quiet and meditative. There will be people around Nathan Phillips Square distributing gifts just for the joy of giving. Your kids should have more fun making little gifts themselves beforehand. Then they will be seeing the astonished and pleased reaction when they give them to strangers too. On Saturday evening, you can join the colourful Solstice parade and bonfire in and near Kensington Market. Runnymede United Church has services for children but I’m sure, other churches have these too. Kensington Market Solstice Parade. Copyright ©2013 Ruth Lor Malloy. On Tuesday, December 24, City Hall is the site of a Christmas choral concert for the price of a toy. 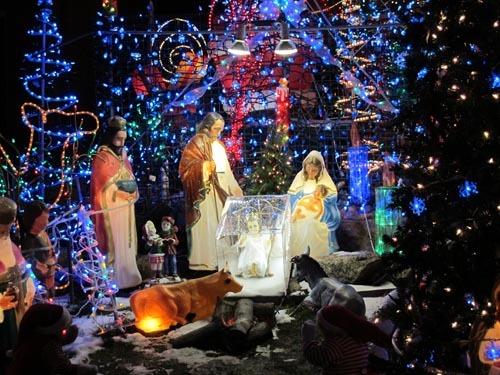 In the evening, you have your choice of at least two churches with outdoor pageants about the Birth of Jesus Christ. You might be interested in going to an ethnic Christmas church service. 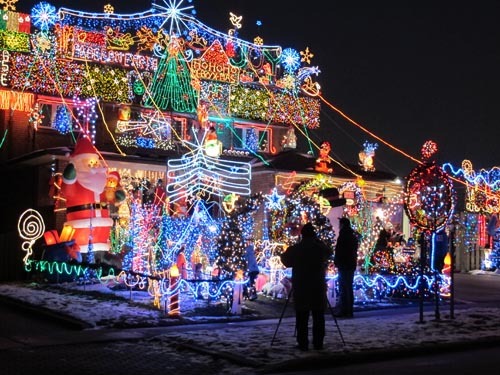 Some of these are also listed in www.torontomulticulturalcalendar.com. On December 26, Boxing Day, admission to the Toronto zoo is half price. Admission to the High Park zoo is free every day. 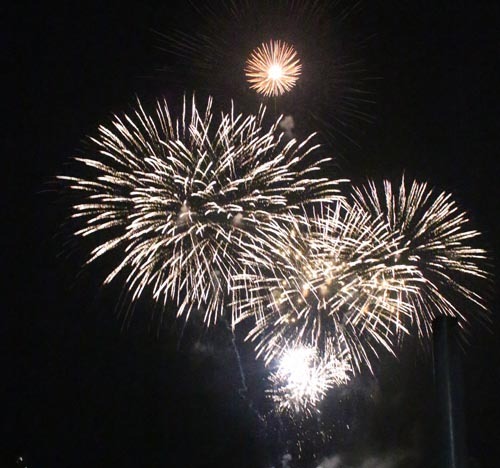 On New Year’s eve, CityTV has its annual big bash in Nathan Phillips Square with lots of entertainment and fireworks. This alcohol-free event is great for families. For younger children, there’s usually a very popular free ice-skating party and at 9pm a count-down to the New Year at Rennie Park skating rink. Then they can go home earlier than midnight to bed. The Toronto Zoo also has an early count-down for kids but admission prices are above the guidelines of our website. Not mentioned in this website yet are the possibilities of families with older children volunteering in homes for the aged or other such social service institutions during Christmas Break. You could help to serve or entertain at holiday dinners or parties. Toronto has many homes centred around seniors from China (http://www.yeehong.com/centre/volunteer.php) and from Finland. You can access the Suomi-Koti Finnish Home website at: http://www.suomikoti.ca/#Volunteers. Japanese Social Services has a list of volunteer needs at http://www.jss.ca/english/volunteer.html#volunteer. And there are many more. Also free to enjoy are the many lighted buildings and trees around town. Look for the outdoor creches. I’ve deliberately avoided mentioning visits to Santa Claus because I’m sure you can find these yourself in every mall, the commercial side of Toronto’s Christmas. Jesus taught peace, love and forgiveness which is what we wish for all of you at this time of year.